If you watched any of the U.S. Open golf coverage this past weekend the word “fescue” was repeated frequently, plus you likely heard how dry it has been in the Pacific Northwest. If you have listened to any weather summaries recently or if you read my past two Crop and Pest Report forecasts, the word “ridge” has been commonly mentioned. The ridge that has been over the northern Pacific Ocean will shift east into the northern Rockies over the next several days. Figure 1 illustrates the projected upper-level flow pattern (parallel to the black lines) and height anomalies from average for Monday. This pattern of a western ridge and an eastern trough will bring very warm weather to the western one-half of the United States and below average temperatures for the eastern part of the country. For our area it will bring above to well above average temperatures. Plus, with the storm track coming in out of Canada, any precipitation that develops will generally be light and highly scattered. Therefore, the week will overall be dominated by mostly dry and warm conditions, with western North Dakota and eastern Montana getting hot (90s), especially this Sunday and Monday. 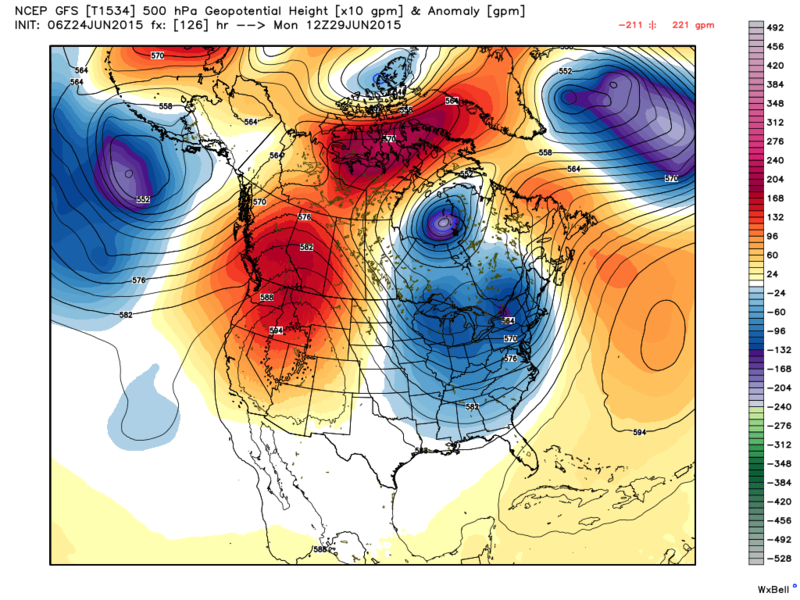 This ridge is expected to shift back to the North Pacific Ocean toward the middle of next week, meaning much cooler temperatures and a rain threat would return to the Northern Plains leading into the Independence Day weekend. 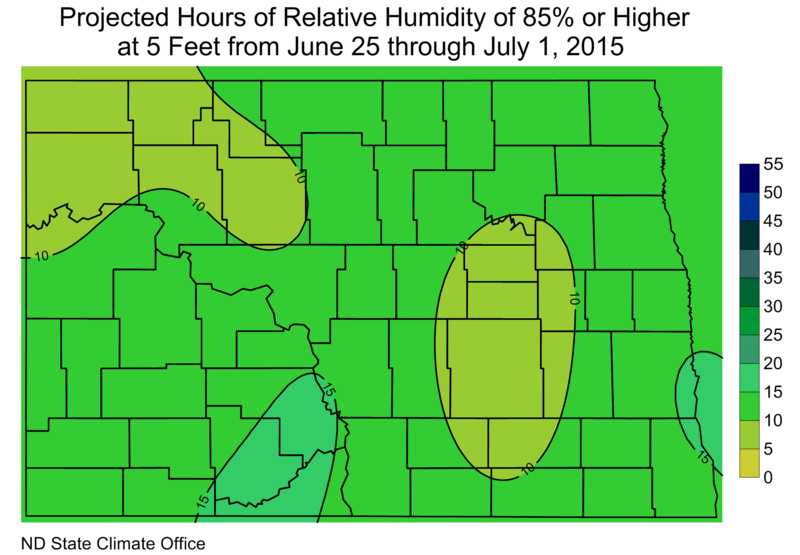 With minimal rain threats and a dominating air mass from the Canadian prairies, near surface relative humidity levels are expected to be frequently low (Figure 3) which will lessen fungal growth potential, drying the top soils and aiding in higher daytime maximums through early next week. 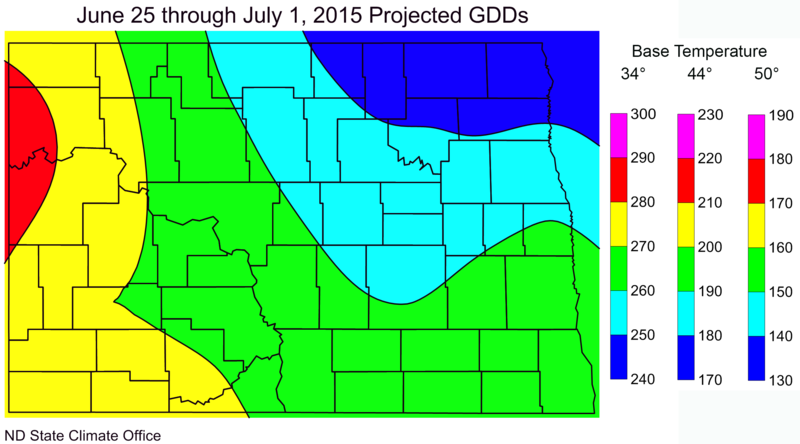 Projected growing degree days (GDDs), base 34°, 44° and 50° for the period June 25 through July 1, 2015 are presented in Figure 2. The next 7 days are expected to produce more GDDs than any other such period so far this growing season.